3 Ways To Style Your Bomber Jacket With Ease - Bomber Jacket LookBook! The Bomber Jacket is in this season. What started slowly has grown to become the trendiest fashion statement. It is a perfect way to tackle the cold weather while looking debonair. It has charmed its way into the minds, wardrobes and wish lists of almost all the stylists, celebrities and fashion icons. In my earlier article we have covered the important points to keep in mind before buying a Bomber Jacket. So you have brought the Bomber Jacket of your choice and can’t wait to show it off in front of all your friends and for that matter even to random strangers! But you are still undecided on how to sport the jacket and what to team it up with and whether you can wear it to work or any formal occasion. So to help you out we have 3 different ways to style your Bomber Jacket with Ease. For a casual look team up your Bomber Jacket with a pair of denims. A slightly distressed and ripped pair of denims or chinos is what I recommend. Make sure the denims fit you perfectly and are not sagging or loose or bulky. Sport a T-shirt under your jacket. If you love tees with graphic designs or art make sure it looks a bit vintage, it will add more character to your look Pick colours that are not too loud, it’s your Bomber jacket that should stand out. Complete the look with a pair of fashion sneakers. You can wear your Bomber jacket even with your formal wear. Pair it with some slim fitted denims or trousers that are cropped and end at your ankles. Match this with a formal shirt and tie. Please make sure your shirt and tie are colour coded with your bottom wear and also with each other. You can even layer this look by adding a cardigan to the mix. Believe me it looks gallant and polished. 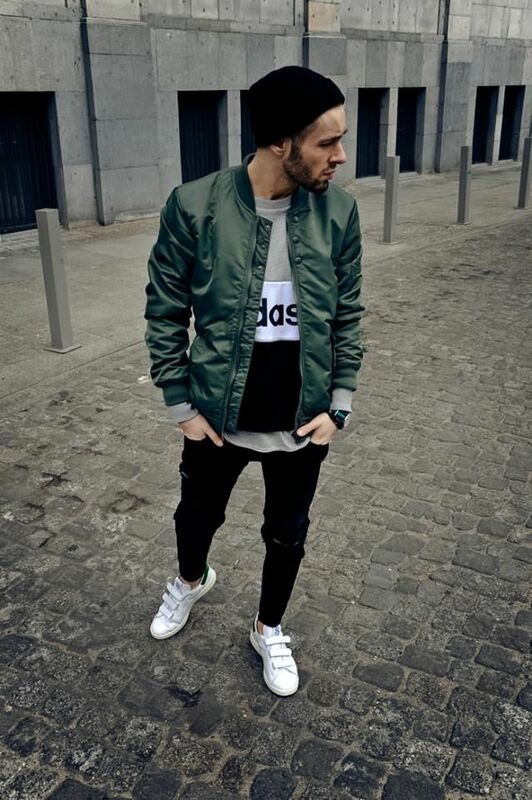 Again pick monotone colours so that your Bomber jacket stands out. The cardigan should be solid; it’s a classic you can’t go wrong with. And if you cannot team it up well I would suggest you avoid printed cardigans, they are harder to co-ordinate with your Bomber jacket. Please make sure you pick your shirt and cardigan in a thinner material. You want to look hot not feel it too. And there is a difference in keeping warm and being stuffy. Pick lighter fabrics so that you do not feel suffocated and uncomfortable especially in your sleeves region, as that is where your Bomber jacket will be slimmer in its fitting. Complete this look with your formal dressy shoes or a pair of monk straps. This is my personal favorite. I have seen a couple of guys sporting this look and believe you me they looked unbelievably cool and impossible to ignore. This is one look that will give you a relaxed and no care attitude and win you many compliments. For this look you need a pair of denims that fit you well. Team it up with a hoodie in a darker colour preferably something solid in neutral colour like black or navy blue. It would do well to pick your denims in similar or complimentary shades. Pick a hoodie that is not too thick especially if the weather is not that cold or you will experience discomfort. Wear your Bomber jacket over your hoodie. Have fun with your Bomber Jacket and enjoy the cool weather looking dapper and winning hearts!